How I Use Earnings For The 1% Income Portfolio. (NYSE:DE) has earnings on the 26th of December. We go through a typical scenario where we would sell puts to take advantage of inflated option premium. Usually there is a month between that payment of a dividend and earnings announcements. In this interim period, we want to sit tight to let the call prices expand. Finally we make these trades automatic. (This removes emotion out of investing). We use trailing orders to buy back sold puts or calls after they are sold. As Income investors, we need be very mindful of when companies announce earnings. As premium sellers, we can take advantage of inflated option premium in order to earn more income. Moreover, we must learn when not to sell option premium even when we think there is easy money on the table. As an investor, invariably there are times when it is much better doing nothing because the reward outweighs the risk. Let’s go through in detail how I incorporate companies earnings into our 1% portfolio in order to maximise our income and to ensure we get the maximum return on any options sold. Firstly Deere & Company(NYSE:DE) (The 1% portfolio is not taking this trade) is announcing earnings on the 11/26/2014 and as a result implied volatility rank is inflated. If this was an underlying we wanted to hold in our portfolio we would put on the trade as follows. 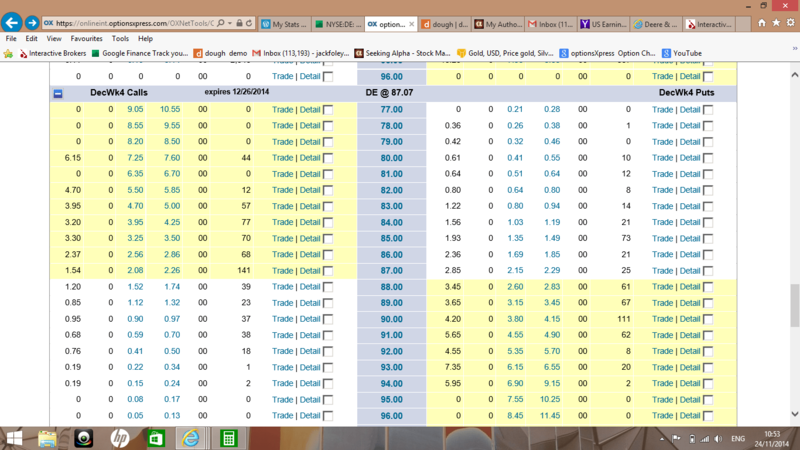 We would sell the DEC26-$83PUT for $0.85. The stock at the moment is trading at just over $87 so this gives us almost 5% downside protection if we get “put” the stock. If after earnings the price of stays above $83, then it will most certainly be a winner as option premium contracts after earnings are announced. Since volatility after earnings contracts quickly, we usually insert a trailing order (O.T.O – which means one order triggers another order). When our sold put order gets filled, we immediately have a 50% profit “buy order” working automatically. See options chain below for DEC26th. A dividend will be paid for this stock around the start of February so we will want to be holding some stock around that time to avail of the dividend. Next earnings will be the end of February so as educated income investors, we will not sell option premium (using covered calls) the day after we collect the dividend. The reason being is that our positions will work against us. For this particularly underlying there is a full 3 weeks between the payment of the dividend and the announcement of earnings. In this time period, options prices will elevate so it would be wise on our part to wait until a few days before first quarter earnings announcement and then sell covered calls. We will be able to pocket far more premium and if the stock gets “called away” from us, we will have made a handsome capital gain on the stock also. This is what I was referring to in the first paragraph when I said sometimes it pays to do nothing. There is no point selling covered calls when they (the calls) are going up in price. We sell at the top and then we buy them back when the option premium contracts after earnings. To sum up, here are the takeaways that we will adhere to in the 1% portfolio. Finally, let’s go through where the portfolio is at the moment. This entry was posted in Trading and tagged (NYSE:GDXJ), ◾(NYSE:DE) has earnings on the 26th of December, KO - 20/11/2014 Sold 43-DEC26 Naked Put, MCD - 20/11/2014 Sold 94-DEC26 Naked Put, S&P500, UNG - 20/11/2014 Sold 21-DEC26 Naked Put. Bookmark the permalink.